An Alberta government program intended to cull wolves and protect endangered caribou herds inadvertently poisons too many other animals, a filmmaker says. Andrew Budziak is the producer of Poisoned Earth, a new documentary that takes a critical view of Alberta's wolf cull practices, which include the use of lethal snares, leghold traps, aerial shooting and strychnine poisoning. The use of strychnine, a powerful rodenticide, is inhumane and causes unnecessary deaths to many non-targeted species, Budziak said. "We really needed people to see what was going on here, what was happening with this program," Budziak said in an interview Monday with CBC Radio's Edmonton AM. "Strychnine is a really nasty poison. This is an indiscriminate killer." "Nothing should die this way." Conservation groups have long called for an end of strychnine poisoning in Alberta's wolf-cull program. Numbers obtained by Wolf Awareness Inc. in 2017 through the Freedom of Information Act show about 1,200 wolves have been culled since the population control program began in 2005. About 250 other animals have also been accidentally poisoned, according to the Alberta government. Those numbers fail to fully account for animals killed by feeding on the carcasses of poisoned wolves, Budziak said. His documentary relies on internal government documents, testimony from land users, conservationists and pest-control experts to provide an in-depth look at the program's biological impacts. He describes the poisoning program as a "scorched earth policy." "We needed people to see what we saw out there," Budziak said. "It really was a ring of death out there. And it is a nasty sight. Acting on a tip from a concerned land user, Budziak and his crew travelled from Toronto to Hinton, Alta., in October and found a wolf poison site deep in the bush. The area was littered with fresh animal remains. "What we found was shocking," he said. "We came across a dead wolf that had been torn from limb to limb. "We found raven feathers, coyote hide, fox bone. All in all, we found between 15 and 16 dead animals." Budziak said the site was not cleaned up and monitored as mandated by health guidelines. Carcasses contaminated with poison were left to rot and endanger other wildlife. "This site should have been wrapped up end of February, early March, which means any poison that's left on the ground is removed and any animals that were poisoned as a result of this are removed. "This site and others are not being cleaned up, so this strychnine is remaining on the earth, in the environment, well into the summer months." A provincial government spokesperson could not say if the site between Hinton and Grande Cache was managed by the government or by a private landowner. 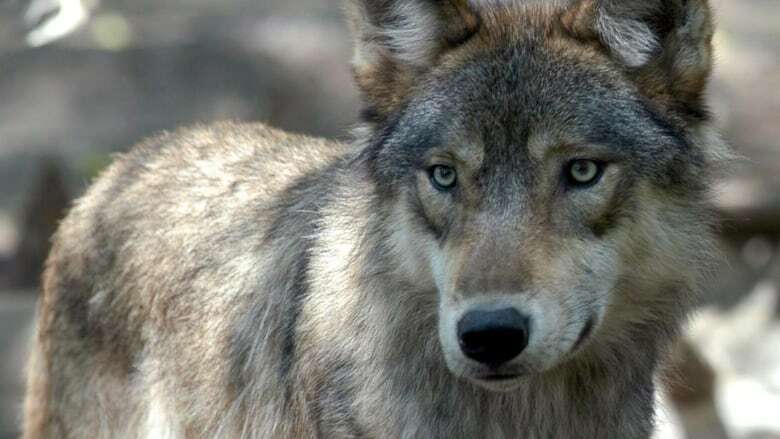 In an emailed statement, the province suggested that poison is only used to cull wolves in rare circumstances, and that use is strictly regulated. "Annual wolf population reductions to avoid the loss of caribou populations are primarily conducted through aerial tracking and shooting of wolves, but also through the use of chemical toxicants," a government spokesperson said in an emailed statement. "Chemical toxicants are only used in extreme situations, after other methods have been demonstrated to require this additional management action. "The use of toxicants allows the removal of animals that filter into the target areas while aircraft are not operating, and allows removal of wolves that are impossible to target from the air: transient wolves and small packs that move a lot. The only toxicant used by the Government of Alberta is strychnine, the province said in a statement to CBC News. "The use of this substance is regulated by the Government of Canada, which requires strict reporting and safety protocols," the government statement said. "Alberta is licensed to use this substance and rigorously follows all such protocols." Strychnine is also used on some Alberta farms to control gopher and ground squirrel populations. Health Canada is looking at banning the substance because of the potential to harm non-targeted animals. Public consultations are now underway. Health Canada told CBC News it has received reports that the poison has led to the deaths of a badger, a weasel, foxes, antelopes, dogs, deer, horses, a bear cub, mice, rats, moles and various birds. Budziak said his documentary is still a couple months away from completion. He extended timelines for the project after learning of the Health Canada investigation. He has launched a Kickstarter campaign to raise the $3,000 needed to finish production. In the meantime, he hopes for more clarity on whether the program will be abolished. "We thought this would be a short film to complete, but that's turned out not to be the case," he said. "We still want answers."